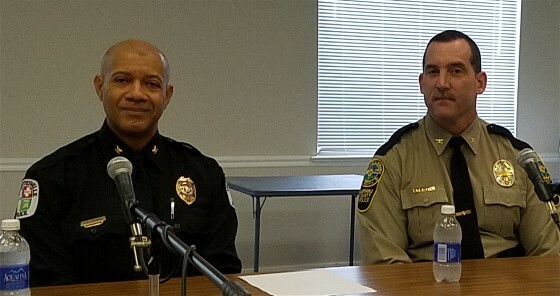 Charlottesville Chief of Police Al Thomas Jr. (left) and Albemarle County Chief of Police Ron Lantz addressed current policing issues including traffic concerns, staffing levels, drugs and gangs. They spoke at our Wednesday, November 8, 2016 meeting. The program was moderated by SSV Vice President Rich DeMong. A podcast of the one-hour presentation and Q&A is below. Charlottesville Chief Al Thomas spoke about changing the structure of the department’s ranks — including the recent promotion of Maj. Gary Pleasants to the role of deputy chief. He also addressed the need to focus more efforts on connecting with the community and listening to what people want. Albemarle County Chief Ron Lantz addressed his department’s efforts in geopolicing, a strategy that splits the county into geographical sectors and assigns officers to specific areas, allowing them to better engage their community. He also spoke about traffic being one of the biggest issues his officers face, most notably distracted driving. Lantz said he hopes to hire more officers and, eventually, open a district police station in the north part of the county near Hollymead Town Center. Along with the addition of a new satellite office in Crozet, he said he’d like to see another open in the urban ring near apartment complexes with high numbers of calls for service. This entry was posted on Thursday, November 10th, 2016 at 5:09 pm	and is filed under Programs. You can subscribe via RSS 2.0 feed to this post's comments. Both comments and pings are currently closed.